As the unemployed 32 year old Abdellah El Boukzati demonstrated against the plundering of Western Sahara, Moroccan police intervened. "We demonstrated asking that they stop the exploitation of our natural resources and demanded that the beneficiaries of the resources should be the Sahrawis", El Bouktazi explained Western Sahara Resource Watch. Together with other Sahrawis, he participated in a demonstration on the 12th of October against the Moroccan occupation and plundering of Western Sahara. "It is only the Moroccans and the big foreign firms who are profiting from the wealth of Western Sahara", he stated in an email. When the police and security forces intervened, he tells that several were injured. 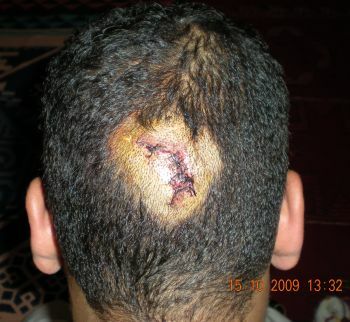 The beatings from the police caused the injuries he sustained in the face and back of his head, he explains. Bouktazi lives in El Aaiun, where he was born three years after Morocco invaded Western Sahara. The UN legal counsel stated in 2002 that Morocco cannot exploit or explore the natural resources in Western Sahara if the people are Western Sahara is against it.